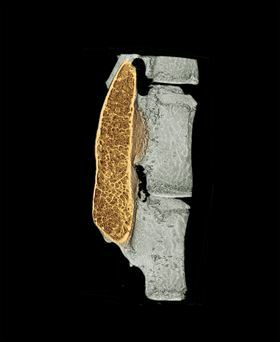 The colored region in this micro-CT image shows regenerated high-quality bone in the spine, produced with minimal use of growth factor. Image: Northwestern University. There has never been a gold standard for how orthopedic spine surgeons promote new bone growth in patients, but now scientists at Northwestern University have designed a bioactive nanomaterial that is so good at stimulating bone regeneration it could become the new preferred method. While so far studied solely in an animal model of spinal fusion, this novel approach to promoting new bone growth could translate readily to humans, the researchers say. The nanomaterial could thus prove highly beneficial for an aging but active population in the US that is increasingly receiving surgery to treat pain due to disc degeneration, trauma and other back problems. Many other procedures could also benefit from the nanomaterial, ranging from repair of bone trauma to treatment of bone cancer to promotion of bone growth for dental implants. "Regenerative medicine can improve quality of life by offering less invasive and more successful approaches to promoting bone growth," said Samuel Stupp, who developed the new nanomaterial. "Our method is very flexible and could be adapted for the regeneration of other tissues, including muscle, tendons and cartilage." Stupp is director of Northwestern's Simpson Querrey Institute for BioNanotechnology and professor of materials science and engineering, chemistry, medicine and biomedical engineering. For this interdisciplinary study, Stupp collaborated with Wellington Hsu, associate professor of orthopedic surgery, and Erin Hsu, research assistant professor of orthopedic surgery, both at Northwestern University Feinberg School of Medicine. This husband-and-wife team is working to improve clinically employed methods of bone regeneration. Sugar molecules on the surface of the nanomaterial provide its regenerative power, while the nanomaterial is built from self-assembling molecules known as peptide amphiphiles, first developed by Stupp 15 years ago. These synthetic molecules have been essential in his work on regenerative medicine. The researchers studied in vivo the effect of the ‘sugar-coated’ nanomaterial on the activity of a clinically used growth factor called bone morphogenetic protein 2 (BMP-2), finding that 100 times less BMP-2 was needed for a successful spinal fusion. This is very good news, because the growth factor is expensive and known to cause dangerous side effects when used in the amounts currently required to regenerate high-quality bone. Stupp and his team report their findings in a paper in Nature Nanotechnology. Stupp's biodegradable nanomaterial functions as an artificial extracellular matrix that mimics the bodily environment cells are normally exposed to, while BMP-2 activates certain types of stem cells and signals them to become bone cells. Consisting of tiny nanoscale filaments, the Northwestern matrix binds BMP-2 in the same way that natural sugars bind it in our bodies and then slowly releases it when needed, instead of in one early burst, which can contribute to side effects. To create the nanostructures, the research team led by Stupp synthesized a specific type of sugar that closely resembles those used by nature to activate BMP-2 for bone growth. Rapidly moving, flexible sugar molecules displayed on the surface of the nanostructures ‘grab’ the protein at precisely the same domains used by naturally-occurring sugar molecules, promoting the bone-growing signals. In nature, the sugar molecules are known as sulfated polysaccharides, which have highly complex structures that are impossible to synthesize at the present time using chemical techniques. Hundreds of proteins in biological systems are known to have specific domains that bind these sugar polymers in order to activate signals. Such proteins include those involved in the growth of blood vessels, cell recruitment and cell proliferation, all of which are important for tissue regeneration. This means the approach developed by the Stupp team could be extended to other regenerative targets. Spinal fusion is a common surgical procedure that joins adjacent vertebra together using a bone graft and growth factors to promote new bone growth, stabilizing the spine. The bone used in the graft can come from the patient's pelvis – an invasive procedure – or from a bone bank. In the in vivo section of the study, the nanomaterial was delivered to the spine using a collagen sponge. This is the way surgeons currently deliver BMP-2 to promote bone growth. The Northwestern research team now plans to seek approval from the US Food and Drug Administration to launch a clinical trial to study the nanomaterial for bone regeneration in humans. "We surgeons are looking for optimal carriers for growth factors and cells," Wellington Hsu said. "With its numerous binding sites, the long filaments of this new nanomaterial is more successful than existing carriers in releasing the growth factor when the body is ready. Timing is critical for success in bone regeneration."